Listed here is critical information about Chernobyl, a name that, like Bhopal, has come to represent the epidome of man's inappropriate behavior based only on the intellect's capacity to ask, Is it possible? If we are to survive as a species, and be the true conservators of this place as our response abilities endow us with, we MUST temper the intellect's youthful inexperience with the age-old instinctual and intuitive wisdom that always asks Is it appropriate? when considering any activity. Chernobyl is a clear message to humanity that nuclear power (to say nothing of weapons) is not an appropriate exercise of human intelligence. It is omnicidal. —Introduction, page 1, Chernobyl: Consequences of the Catastrophe for People and the Environment, by Alexey V. Yablokov, Vassily B. Nesterenko, Alexey V. Nesterenko, Annals of the New York Academy of Sciences, Volume 1181, December 2009, 335 Pages. 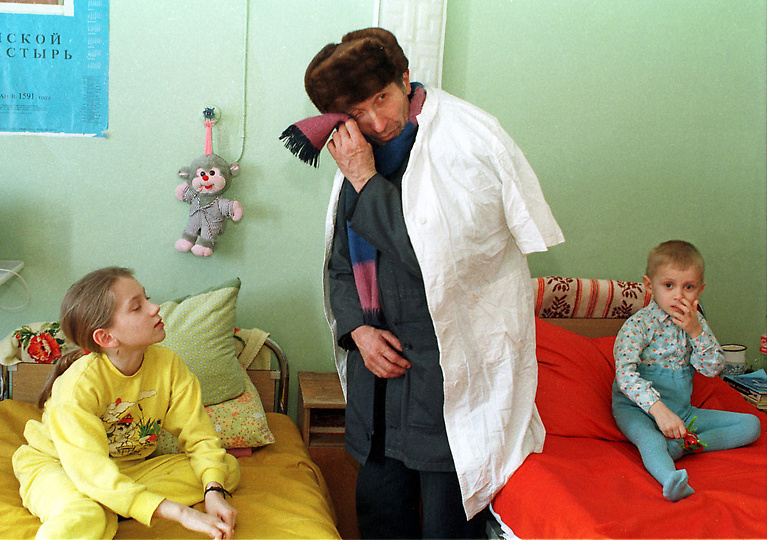 19 Mar 1996: Ivan Kalenda turns away to wipe his tears as he visits his 3-yr-old grandson Vitya, right, in the children's cancer ward at a hospital in Gomel, 300 kms, 186 miles southwest of Minsk, Belarus. Mar 2009: the sarcophagus of Chernobyl reactor 4. Photo credit: Timm Suess via Flickr. See also: Timm Suess' Chernobyl Journal. Mar 2009: Ferris wheel that was to be inaugurated in children's amusement park a week after the explosion stands eternally unused. Photo credit: Timm Suess via Flickr. See also: Timm Suess' Chernobyl Journal. The most serious effect of the Chernobyl radiation is to the brain and is a major medical, social and economic problem for the affected individual, the persons' family and society at large. . . . Inexplicably, WHO had a special project on brain damage in the Chernobyl territories, which was abruptly stopped after the first definitive results. It is becoming clear that low-dose and low-dose rates of radiation have a profound effect upon fine structures of the nervous system, upon higher nervous system function and upon neuropsychiatry function. . . . The human and economic costs are enormous: In the first 25 years, the direct economic damage to Belarus, Ukraine and Russia has exceeded $500 billion. To mitigate some of the consequences, Belarus spends about 20 percent of its national annual budget, Ukraine up to 6 percent and Russia up to 1 percent. Funding from other countries and from the U.N. is essential to continue scientific studies and to provide help to those who continue to live with significant radioactive contamination. . . . Even if the extent of the health effects is not yet clear, it can still be predicted that the suffering brought about by the nuclear disaster in Fukushima is, and will be, of a similar magnitude. DR. JEFF PATTERSON: [N]uclear power, nuclear energy, has three poisonous Ps, and those are pollution—and we're certainly seeing the example of that now at the 25th anniversary of Chernobyl. That pollution occurs all along the fuel cycle, from the time we dig it out of the ground, the tailings that are left and expose people to radon, to the proliferation of nuclear weapons, to the production of fuel, and then we don't know where to bury the waste or what to do with it. And now we're seeing the catastrophic release of radiation once again, which happened at Kyshtym in Russia, happened in Chernobyl, and now is happening in Fukushima—and will happen again. And so, pollution is the first thing that is the poisonous P.
Second is price. And as Medvedev said—he claims that this is the cheapest form of energy. It's by far and away the most expensive form of energy. When we figure in the results of these disasters and the cost to people's health, the economic loss, the agricultural loss, the Ukraine, in the initial days of this, spent a sixth of their national budget on Chernobyl. And Belarus and the Ukraine are still spending five to seven percent of their national budgets every year to deal with the Chernobyl accident. If we figured all of that in to the cost of nuclear power, nuclear power becomes extremely expensive. As Dr. Sherman mentioned, the next sarcophagus that they're proposing to build over the nuclear power plant, they're estimating will cost $1.1 billion, and they've only raised $800 million for this now. It's already three years behind time in terms of being built. And so, the question is, will this ever get done, because the cost of this is so much. The cost of building a new nuclear power plant is so expensive that, chances are, none will be built, because nobody wants to fund them. And the third poisonous P is proliferation. Nuclear power and nuclear weapons go hand in hand. Medvedev talked about the peaceful atom that was designed by Eisenhower. Well, it's out of the peaceful atom program that has come nuclear weapons for many countries. And we're seeing the example of that in Iran today. So, these are deadly parts of the nuclear experiment that we are conducting today that, in my opinion, is a highly unethical experiment. . . .
DR. JANETTE SHERMAN: . . . . When a nuclear reactor explodes, the radiation goes around the entire hemisphere. It is not confined to where the people live—or where the accident occurred. The effects are ubiquitous across all species: that's wild and domestic animals, birds, fish, bacteria, viruses, plants and humans. So the effects are extremely serious, and they last for generations. We're terribly concerned about Belarus, where only 20 percent of the children are now considered healthy. So, what do you do with a society if 80 percent of your population is sick? Who are going to be the artists and the musicians and the scientists and the teachers, if your population is not well? . . . It's very, very, very important to keep adequate records on exposures and the effect of the workers and make them publicly available, certainly not by the name of the individual person, but certainly the data needs to be available and transparent so scientists can follow what is happening to these people. The problem within Chernobyl was that they released almost no data for three years, and it was very, very difficult to reconstruct what was happening. And as Dr. Patterson pointed out, many of these records have disappeared. And indeed, many records of nuclear workers in the United States have disappeared, and it has—workers have a very hard time finding what their exposures were, even when they knew what their job description was. Chapter 25, "Main Text: A Closing Statement"
This is a graphic reconstruction of the path of the first 14 days of the 1986 Chernobyl radioactive plume. It was created by the French Government's official agency on radiation and nuclear matters, the INSTITUT DE RADIOPROTECTION ET SÛRETÉ NUCLÉAIRE (IRSN). Also included is a graphic from Lawrence Livermore National Laboratory showing dispersions of Chernobyl radioactive cloud on 27 April and 6 May 1986. Graphic reproduced from page two of "The Chernobyl Catastrophe, Consequences on Human Health," Greenpeace, 18 April 2006. Immediately after the catastrophe, release of information was limited, and there was a delay in collecting data. WHO, supported by governments worldwide could have been pro-active and led the way to provide readily accessible information, but did not. These omissions resulted in several effects: limited monitoring of fallout levels, delays in getting stable potassium iodide to people, lack of care for many, and delay in prevention of contamination of the food supply. . . .
Key to understanding effects from nuclear fallout is the difference between external and internal radiation. While external radiation, as from x-rays, neutron, gamma and cosmic rays can harm and kill, internal radiation (alpha and beta particles) when absorbed by ingestion and inhalation become embedded in tissues and releases damaging energy in direct contact with tissues and cells, often for the lifetime of the person, animal or plant. . . .
and Alexey V. Nesterenko (Institute of Radiation Safety, Minsk, Belarus). Western Michigan University, Kalamazoo, Michigan). now available; 347 pages—with index. This book is the only publication to document non-cancer incidence and mortality in countries outside the Russian Federation, Ukraine, and Belarus and serves as a frame of reference and counterweight for officials who are obscuring the full scope of the Fukushima Dai-ichi disaster. First published by the prestigious New York Academy of Sciences (Nov. 2009 in its ANNALS), it is now out of print, causing lead author, eminent Russian biologist Doctor Alexey Yablokov, to request the right to reprint (recently granted). This reprint edition includes a separate index that was not part of the original book. Dr. Yablokov contacted his Consulting Editor, Janette D. Sherman-Nevinger, MD, and Timothy Mousseau, Associate Vice President for Research & Graduate Education, University of South Carolina, and asked them to be his agents in the U.S. The book is now for sale directly from the printer (see below). ORDER NOW: Book prices include shipping and handling, anywhere in the U.S.
For credit cards orders, please mail < tony at grekoprinting dot com >. Include credit card number and expiration date, or call the print shop with credit card info, Plymouth, MI (9-5, M-F, EDT). Please include mailing address. Chair, International Science Oversight Board (Doctors Yablokov and Sherman-Nevinger are board members). In his foreword, Dr. Dimitro Grodzinsky, chairman of the Ukranian National Commission on Radiation Protection, writes about how "apologists of nuclear power" sought to hide the real impacts of the Chernobyl disaster from the time when the accident occurred. The book "provides the largest and most complete collection of data concerning the negative consequences of Chernobyl on the health of people and the environment. . . . The main conclusion of the book is that it is impossible and wrong `to forget Chernobyl.'" . . . The book details the spread of radioactive poisons following the explosion of Unit 4 of the Chernobyl nuclear plant on April 26, 1986. These major releases only ended when the fire at the reactor was brought under control in mid-May. Emitted were "hundreds of millions of curies, a quantity hundreds of times larger than the fallout from the atomic bombs dropped on Hiroshima and Nagasaki." . . . There is an examination of genetic impacts with records reflecting an increase in "chromosomal aberrations" wherever there was fallout. This will continue through the "children of irradiated parents for as many as seven generations." So "the genetic consequences of the Chernobyl catastrophe will impact hundreds of millions of people." . . .
Further, "the concentrations" of some of the poisons, because they have radioactive half-lives ranging from 20,000 to 200,000 years, "will remain practically the same virtually forever." [Near the end of the book,] "The Chernobyl catastrophe demonstrates that the nuclear industry's willingness to risk the health of humanity and our environment with nuclear power plants will result, not only theoretically, but practically, in the same level of hazard as nuclear weapons." —Chapter 15. Consequences of the Chernobyl Catastrophe for Public Health and the Environment 23 Years Later, page 326. Chernobyl: Consequences of the Catastrophe for People and the Environment. The link between U. S. atomic veterans and Chernobyl victims is even closer. The Army's Infantry School Quarterly asserted: "A soldier is not a casualty until he requires treatment. Even though he has been exposed to a lethal dose of radiation, he can perform his combat mission until symptoms appear." The 1987 Central Military Commission of the USSR Ministry of Defense declared: "The presence of acute somatic illness and activation of chronic disease in persons who were involved in liquidation (the clean up workers) who do not have acute radiation sickness, the effect of ionizing radiation should not be included in the causal relationship." Denial is a strong tool -- it supports dangerous industries and denies relief to those who are harmed. But these actions are more than denial -- these are lies. . . . Drawing upon extensive data, the authors estimate the number of deaths worldwide due to Chernobyl fallout from 1986 through 2004 was 985,000, a number that has since increased. . . .
Yablokov and his co-authors find that radioactive emissions from the stricken reactor, once believed to be 50 million curies, may have been as great as 10 billion curies, or 200 times greater than the initial estimate, and hundreds of times larger than the fallout from the atomic bombs dropped on Hiroshima and Nagasaki. . . .
About 550 million Europeans, and 150 to 230 million others in the Northern Hemisphere received notable contamination. Fallout reached the United States and Canada nine days after the disaster. . . .
5. In 1986 the levels of irradiation in plants and animals in Western Europe, North America, the Arctic, and eastern Asia were sometimes hundreds and even thousands of times above acceptable norms. The initial pulse of high-level irradiation followed by exposure to chronic low-level radionuclides has resulted in morphological, physiological, and genetic disorders in all the living organisms in contaminated areas that have been studied—plants, mammals, birds, amphibians, fish, invertebrates, bacteria, and viruses. . . .
11. Wildlife in the heavily contaminated Chernobyl zone sometimes appears to flourish, but the appearance is deceptive. According to morphogenetic, cytogenetic, and immunological tests, all of the populations of plants, fishes, amphibians, and mammals that were studied there are in poor condition. This zone is analogous to a “black hole”—some species may only persist there via immigration from uncontaminated areas. The Chernobyl zone is the microevolutionary “boiler,” where gene pools of living creatures are actively transforming, with unpredictable consequences. . . .
13. For better understanding of the processes of transformation of the wildlife in the Chernobyl-contaminated areas, radiobiological and other scientific studies should not be stopped, as has happened everywhere in Belarus, Ukraine, and Russia, but must be extended and intensified to understand and help to mitigate expected and unexpected consequences. —Chapter 15. Consequences of the Chernobyl Catastrophe for Public Health and the Environment 23 Years Later, pages 323-324. Chernobyl: Consequences of the Catastrophe for People and the Environment.
. . . IAEA subsequently took its radiation protection recommendations directly from ICRP (rather than WHO), therefore persons from the Commission who also sit on UNSCEAR both make the rules and judge their adequacy. Dr. Fred Mettler, Jr. is not the only person to sit on the Commission and also sit on UNSCEAR. This dual role is commonplace and clearly a conflict of interest. . . . The nuclear industry has a monopoly on radiation and human health scientific information, and its dissemination through the Universities into nuclear reactor facilities, hospital radiology laboratories and UN organizations. This poses a further serious problem. Normally, one believes the evidence at hand, rather than the theory! If one has been taught theory as fact, the situation becomes more complicated. ICRP has created an artificial "consensus" on the health effects of radiation. . . . The next logical question is: why would the serious health effects of radiation, such as **non-fatal cancers, (including thyroid, breast and skin), non-cancer somatic effects and teratogenic effects of radiation be discounted and ignored? It is my opinion that this administrative decision made by the physicists of the Manhattan Project was meant as a safeguard against possible objections to the northern hemispheric nuclear fallout. . . . Thus the radiation protection standards proposed by the Manhattan Project physicists and later by ICRP and IAEA have been, from the start, a trade-off between the "benefits" sought by the professional users of ionizing radiation, not least of which were the bomb makers, and the "risk" to life and health of workers and the public. . . . Since the ICRP methodology and radiation risks depend heavily on the Atomic Bomb Research, which looked at the effects of high radiation doses delivered at a fast rate from an external (to the body) source, it fails to address chronic low dose internal radioactive contamination. . . . The IAEA Report of 2005 and UNSCEAR 2000 analysis ignored these considerations. When the international scientific critics of ICRP methodology develop an internationally acceptable alternative, and when the UNSCEAR data gaps are filled, we may be able to adjust this estimate of Chernobyl deaths and severe injuries accordingly. 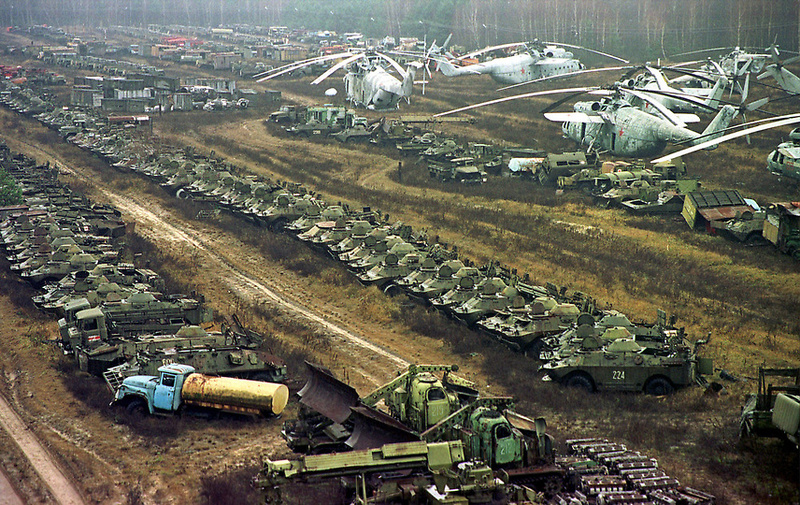 However, the inadequate record-keeping in this high-technology age will always be seen as an attempt to cover-up the true effects of the Chernobyl disaster. Clearly, the true damage to health attributable to the Chernobyl disaster has been hidden from the general public through poor and incomplete scientific investigation, obfuscation and poor recording of data and outright lying. Many people are mystified that three UN Agencies (IAEA, WHO and UNEP) appear to be agreeing on the minimal damage done to the people directly affected by Chernobyl and other low dose radiation exposures. I think this is a failure to understand the profound influence wielded by ICRP which dictates not only what should be of concern to UN Agencies, but also provides the methodology which must be used in order to determine both the dose of ionizing radiation received by the victims and the risk posed by that dose. All of the U.N. Agencies use these same protocols, methodologies and risk estimates -- hence there are no independent assessments. Reform of the UN must assure independence of its agencies. . . . The time has come to replace closed science with open science, self-perpetuating committees with professional societies accountable to their peers, and monopolized areas of research with properly funded transparent scientific research. While physics is needed to identify and quantify the strength and nature of a radiation source, physicians with expertise in epidemiology, toxicology, oncology, pediatrics and community health should describe the injury caused by it, and the ramifications of the exposure for the public health. The need is urgent for UN reform in this important area on which the survival of the human species and the environment may well depend. 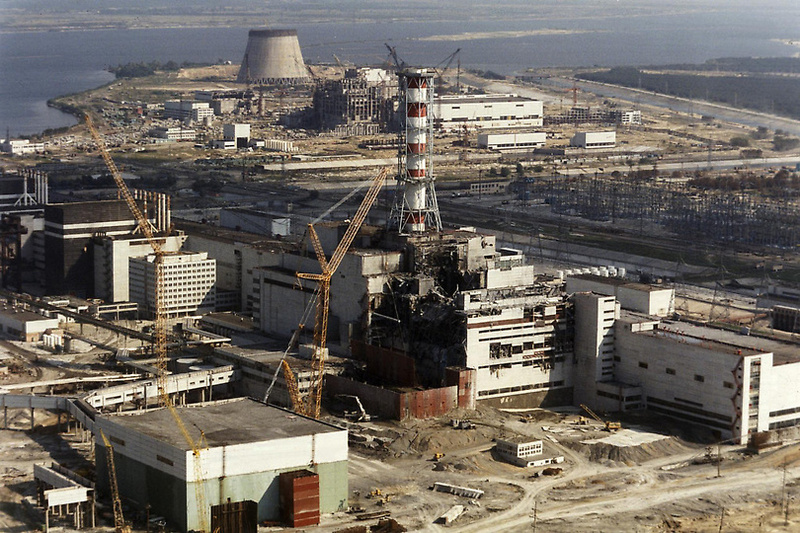 Chernobyl: 25 Years After, Stop the Nuclear Timebomb—Abandon Nuclear Power Now! Against the will of the German people, the operational lifespan of nuclear power plants is being increased. New nuclear power plants are being planned and built in Europe. Politics are slave to the nuclear industry. The fairy tale of “clean” nuclear energy as saviour of the climate and a “stopgap technology” is doing the rounds. In place of responsible policies we find only disinformation. The success story that was renewable energy has been stalled. This is the only international ecological organization born in the USSR. In the middle of 2000 the Socio-Ecological Union brings together more than 25 thousand persons from 19 countries of Europe, Asia and North America. See especially, Programs of SEU. The Institute of Radiation Safety "BELRAD"
The institute of radiating safety "BELRAD" (Institute "BELRAD") was created in 1990 and acts as independent not state organization. The goal of activity of the Institute "BELRAD" is radiation monitoring of the inhabitants of Chernobyl zone and their foodstuffs, development of measures on maintenance of radiation safety and protection of the population on territories, contaminated by radionuclides by realization of necessary scientific researches, development and organization of implementation of their results in practice. This is a humanitarian organisation, which was registered in 1990 in the Ukraine, the epicentre of the Chernobyl disaster. It does not receive any financial support from the government nor from international and lobby organisations. Thus the independence in the assessment of the consequences of the Chernobyl disaster and in the association's objective is sustained. Citizens of the Ukraine as well as foreigners, who take part in this field of activity, can become members of this association: physicians, scientists, journalists and other people, who realise humanitarian goals of the association. Chernobyl Children's Life Line brings several thousand children to the UK each year from Belarus and Ukraine to stay with families in over 100 links around the country; it has a family support project providing financial help to many poor families in Belarus. Friends of Chernobyl Children an ecumenical group working with host families throughout the UK to help socially underpriviledged children affected by the Chernobyl disaster. Chernobyl Continuity Started in 1998 Chernobyl Continuity organises respite holidays in the UK for Belarusian teenagers aged 16 to 18 with a programme designed to expand their horizons by taking part in activities most of us take for granted. Friends of the Belarusian Childrens Hospice funds the building and staff of the Children's Hospice in Minsk which cares for 114 terminally ill or severely disabled children. Has provided training and funding for two professional fundraisers who are working towards making the hospice independent of foreign support in the future. Leaves Of Hope The charity's primary objective is to promote the social, medical and physical well being of the Children of Belarus by seeking to alleviate the consequences of poverty, sickness and distress, by developing programmes of education and training that promote the rights of children, particularly focusing on early intervention, foster care and support for children with disabilities. Chernobyl Children Rye hosts children - from toddlers to 18 year olds, and usually in remission from cancer - in the Rye, Hastings and Battle area. The charity also funds hospice nurses supporting children in their homes in the city of Pinsk. Heart Hope Help has been delivering aid to Belarus for many years, supporting schools, orphanages and Hospices. They are very involved with the Children's Hospice in Slonim. Instead of honoring its victims at this time, Chernobyl is referenced to minimize the impact of Fukuchima. On April 26, 1986, a reactor at the Chernobyl Nuclear Power Plant in the Ukrainian city of Pripyat exploded and began spewing radioactive smoke and gas. Firemen discovered that no amount of water could extinguish the blaze. More than 40,000 residents in the immediate area were exposed to fallout 100 times greater than that from the two atomic bombs dropped on Japan. But the most serious nuclear accident in history up to that time had only begun. Based on top-secret government documents that came to light only in the Nineteen Nineties during the collapse of the Soviet Union, The Battle Of Chernobyl reveals a systematic cover-up of the true scope of the disaster, including the possibility of a secondary explosion of the still-smoldering magma, whose radioactive clouds would have rendered Europe uninhabitable. The government effort to prevent such a catastrophe lasted for more than seven months and sacrificed the lives of thousands of soldiers, miners and other workers. The consequences of this catastrophe continue today, with tens of thousands of disabled survivors suffering from the "Chernobyl syndrome" of radiation-related illnesses, and the urgent need to replace the hastily-constructed and now crumbling sarcophagus over the still-contaminated reactor. As this remarkable film makes clear, The Battle Of Chernobyl is far from over. The film won the Best Documentary Short Subject Award at the 2004 Academy Awards. Due to the unfolding nuclear crisis in Japan, this project has become as timely and important as ever. While Gerd documents the aftermath of the Chernobyl disaster nearly 25 years later, he reminds us that the cost and consequences of nuclear energy will continue to develop for decades to come. Photographer Paul Fusco faces the dark legacy of Chernobyl, focusing on the horrifying human consequences of the event that is now 20 years in the past. Fusco's work forces us to remember an important nightmare that we would forget at the peril of our mortality and our future. [N]uclear power has always aroused my interest, from atomic weapons and eerie-looking gas masks to the invisible dangers of nuclear airborne particles. For me it is the most frightening human creation and something that requires the utmost respect from all of mankind, both as an efficient energy source and as a weapon of mass destruction. In the immediate aftermath of the explosion on 26 April, 1986, few were prepared to endure the massive radiation levels and document the disaster, but Russian photographer Igor Kostin did. In the years that followed, he continued to monitor the political and personal stories of those impacted by the disaster, publishing a book of photos called Chernobyl: Confessions of a Reporter. His images of a deformed boy even led to adoption of the 'Chernobyl Child' in UK. Here is a selection of his finest photographs. 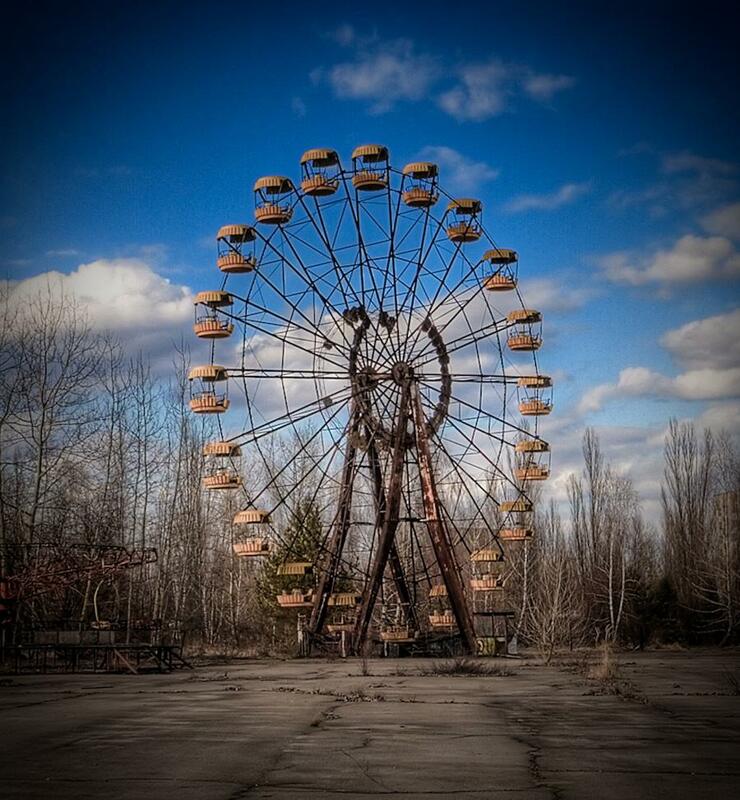 Fifteen years after Chernobyl, the world has moved on. But for Belarus the problems are only beginning. Thyroid cancer rates have risen by 2,400 per cent since the explosion . . . It is the country of Belarus which has suffered, and continues to suffer, most from the disaster: 70 per cent of the radiation has fallen on its land and people. . . . Medical research has shown that radioactive elements (primarily caesium 137 and iodine 131) cross the placental barrier from mother to foetus, contaminating each new generation. Faced with soaring levels of infertility and genetic changes, the gene pool of the Belarussian people is now under threat. 14 years after and beyond . . . But if the threshold speculation is wrong (as shown in this book), and nonetheless we contaminate the planet irreversibly with radioactive poisons, the results might be hundreds of millions of unnecessary cancers over time—as well as a presently unquantifiable price in heritable genetic damage. Chapter 24, "Chernobyl: A Crossroad in the Radiation Health Sciences"
written by Dr. Jay M. Gould, this is the original complete essay before being edited and then published in The Nation, March 15, 1993. Dr. Gould presents the evidence concerning the devastating health effects suffered by the majority of the Russian people from their exposure to the radioactivity released at Chernobyl as being the single most important factor hastening the collapse of the Soviet Empire. by Dr. Vladimir M. Chernousenko, Scientific Director of the attempted "clean up". Chapter 24, from Radiation-Induced Cancer from Low-Dose Exposure: AN INDEPENDENT ANALYSIS, by Dr. John Gofman, 1990. The monolithic nuclear/radiation "community" cannot afford to provide a meaningful analysis of the radiation consequences. Life, for this monolith, requires the lowest possible death consequences of Chernobyl. . . . Those enterprises (military or civilian) which deliver ionizing radiation to people, anywhere in the world, share the common goal of underestimating the health-hazard of ionizing radiation. Thus, the military enterprises, the nuclear power enterprises, and the medical radiation enterprises (x-rays and "nuclear medicine") share a common endeavor. In 1989, a group of radiation experts who were sent to the Chernobyl area by the World Health Organization (WHO) denied that any of the health problems were related to radiation. In May 1991, a report by the International Atomic Energy Agency (IAEA) produced the same denial. Neither report denied health problems. Rather, the reports denied any connection between the problems and radiation. Both sets of experts claimed that the Chernobyl populations which they visited suffered from exaggerated fears about their radiation exposures. We think that the explanation for some of the health problems may be radiation-induced hypo-thyroidism from radio-iodine --- rather than "radio-phobia." This essay explains why. Who will control what information becomes the new "textbook wisdom" about Chernobyl's radiation consequences? Obviously it makes a huge difference. . . .
[O]ver decades and centuries, science has established important barriers against bias -- rules which are widely disregarded today in radiation research. Adherence to these rules will not be demanded by the public, press, and other professions unless they are aware of them. Some of the basic principles will be listed in Part 5 . . . If the world allows the truth about Chernobyl to become distorted by bias in the direction of underestimating its radiation consequences, it would be a warning that the truth about every chemical pollutant is also in danger of comparable distortion. And if all these hazards are systematically distorted by conflicts of interest in the research, humanity everywhere will face not only a vast harvest of radiation-induced misery from "permissible" nuclear pollution, but additional giant harvests from "permissible" chemical pollution of every type. And "mysteriously rising" rates of illness can occur even while the average length of life is growing. Therefore, one of the most vital activities in the field of citizen action and preventive medicine -- today, tomorrow, and forever -- is the fiercest possible defense of objective, untainted databases. There can be no activity more important for human health, for if the databases cannot be trusted and relied upon, then medical science can be turned on its head by mis-information, which can persist as textbook wisdom even for centuries.
. . . The number of children and grandchildren with cancer in their bones, with leukemia in their blood, or with poison in their lungs might seem statistically small to some, in comparison with natural health hazards, but this is not a natural health hazard—and it is not a statistical issue. The loss of even one human life or the malformation of even one baby—who may be born long after we are gone—should be of concern to us all. Our children and grandchildren are not merely statistics toward which we can be indifferent. 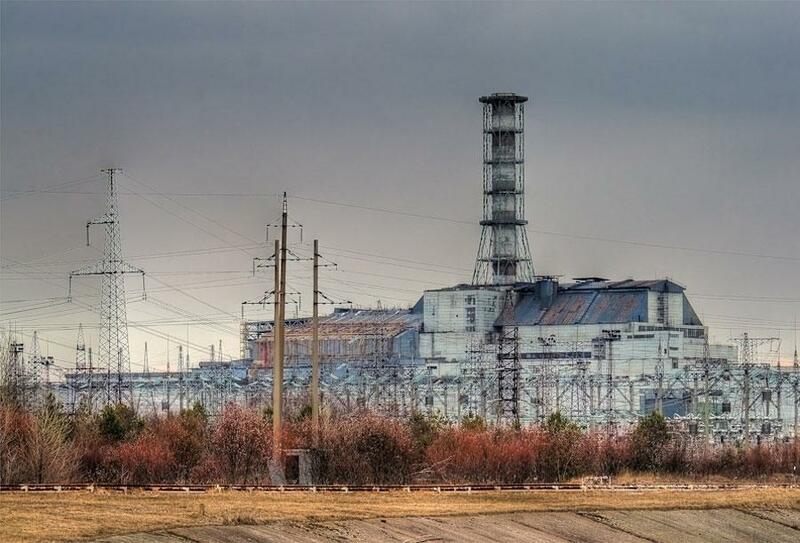 The Chernobyl catastrophe demonstrates that the nuclear industry’s willingness to risk the health of humanity and our environment with nuclear power plants will result, not only theoretically, but practically, in the same level of hazard as nuclear weapons.